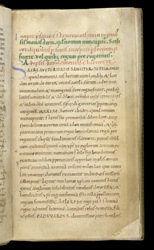 This page has an account of the building of the old abbey in Winchester from its intended establishment by Alfred the Great to its consecration by Dunstan, Archbishop of Canterbury, in the month of July sometime between 980 and 987. It points out that it is proper to commemorate benefactors. This interesting history of the New Minster in the 10th century probably was written in the late 980s and was copied here as part of the historical documentation of the abbey as well as to emphasise its close connections to the kings since Alfred.